Cinnamon Peters runs a pie shop and is getting hitched to the sheriff during the Christmas season. 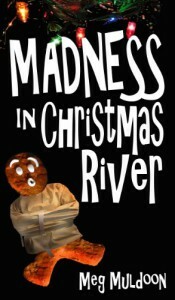 Not really a great time in a place called Christmas River where they really do up Christmas, then Daniel has to go back to California to help with a case. While he was gone all sorts of things happen. Cinnamon's cousin goes missing, her car gets vandalized and her dog hurt. Her ex is in town causing problems and it's a lot for her to handle. She has to figure out what is going on before something worse happens. It's a short cozy read/listen which is what I needed in between a couple of longer listens. I have really enjoyed the narration of Randye Kaye. She does a good job with the voices.